Join thousands of others who've already aced their exams with TuitionKit! Parents! Boost your child's revision! My daughter was failing to reach her potential. Her stress levels were high and her self esteem was low. I felt helpless watching her struggle...TuitionKit was her saving grace, she passed and we can't thank TuitionKit enough - Amazing product! Students love TuitionKit because it enables them to take control of their learning. They can choose when and where they learn or catch up. Students who have accessed such video learning are getting better results than those who haven't. At the start of year 11 I was predicted 3s, but using TuitionKit helped so much. I achieved 7s. I am so happy I can now go on to my college course. No more being in the dark with regards to your child's GCSEs! TuitionKit allows you to give your child all the learning they need at the touch at your fingertips. You can check in at anytime to see what they've done and set them learning schedules, knowing that all the material they need to know is on our site! As a parent who wants nothing but success for their child, are you paying for private tuition? Stocking up on text books and practice papers? TuitionKit not only offers you and your child the ability to revise and learn at a fraction of the cost of tutors and books, but also to access this revision anytime, anywhere via their computer or mobile device. Board specific videos ensure your child receives targeted information, created specifically to aid them in getting great grades at GCSE. They'll even be able to test their knowledge. Give your child the ultimate revision tool today! Worried about your exams? Don't be; TuitionKit has thousands of videos and resources across English, Maths and Science to help you get the marks you need. Try a sample video, or browse them all! Structure your revision around a timeframe that works by creating Learning Schedules of videos. Create and share in-video questions and reminders to track learning.These pop up as the video plays. Import videos from YouTube and use them with Video Events, Learning Schedules and all other features. Create Audio Notes and Audio Questions for yourself or your students, recorded via your mic. Watch the right videos in the right order with our pre-made Video Courses, designed by our expert tutors. Track student progress - share Video Event questions and Learning Schedules with them and track their activity. 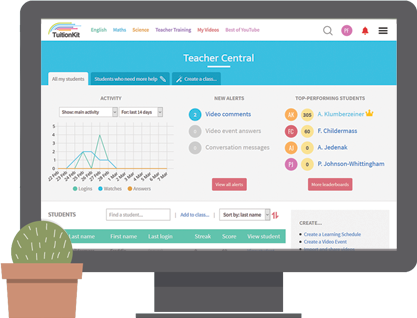 Track and interact with your students using our awesome teacher tools.